KATJA LOHER: WHAT IS THE COLOR OF SCENT? C24 Gallery is pleased to present What is the Color of Scent? A solo exhibition by artist Katja Loher marking her third solo exhibition with the gallery. What is the Color of Scent? will be on view September 6 - October 27, 2018 with an opening reception on Thursday, September 6 from 6 – 8 pm. What is the Color of Scent? transforms the gallery space into an ethereal world in which the viewer journeys through an enchanted universe altered by vision, sound, and scent. On view will be Loher’s signature Videosculptures, Videoportals, Videoplanets, Videonests and Videotables. Expanding on the artist’s exploration into the delicate relationship we have with our ecological environment, Loher’s Videosculptures are inspired by nature and its self-organizing systems. Whimsical videos are embedded in physical objects that mimic organic forms, such as pollen and corals, without hiding the artifice of the technical process. 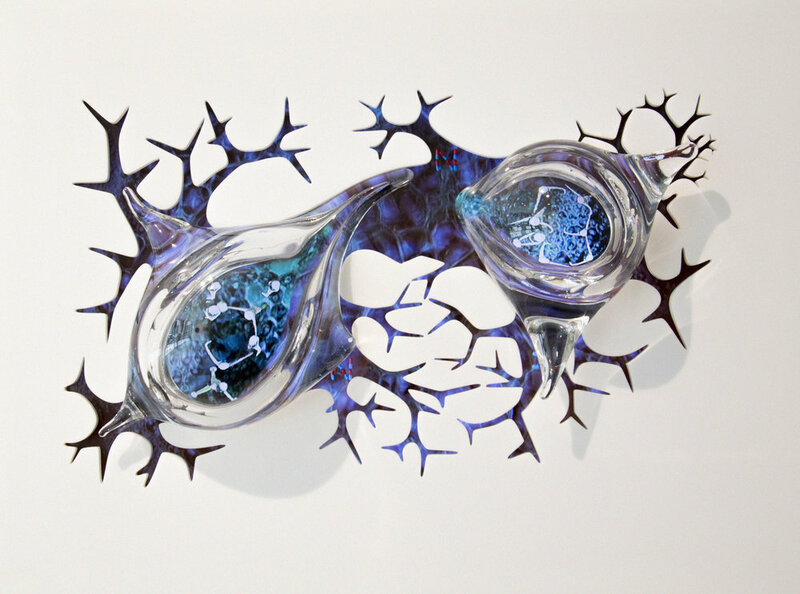 Hand blown glass holds microcosms of beauty and complexity that capture entire alternate worlds and realities. 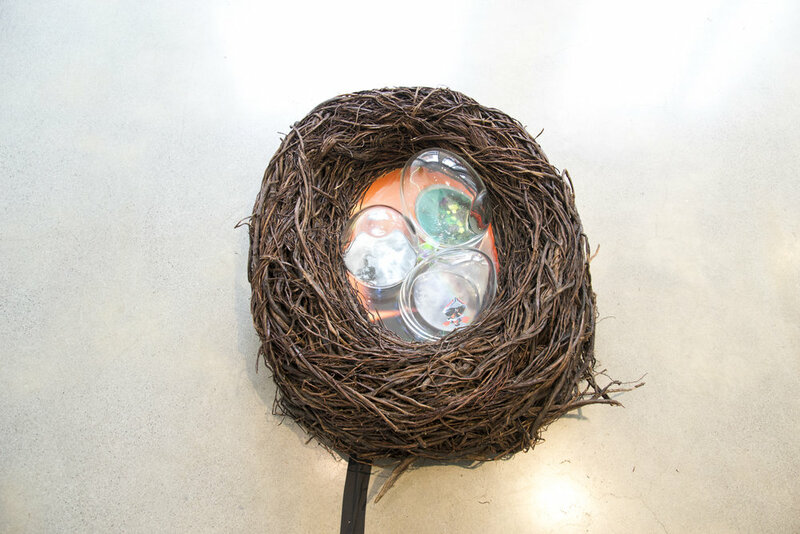 Reminiscent of bubbles and eggs embedded in hand woven abstracted bird’s nests, the organic glass shapes are a poetic commentary on the fleeting nature of time, impermanence, and the natural elements and processes of the world. The deconstruction of the rectangular format of traditional video plays a central role in the intention of Loher’s fantastic environments. The artist breaks away from the canon of video art by liberating video from the constraints of its standard or traditional form. Video is not limited by its medium - it instead becomes a portal into a magical world. Loher’s videos reveal movements of magical beings that create hypnotic mind and eye-bending Mandalas exploring the elements Air, Water, Fire, Earth and Love. 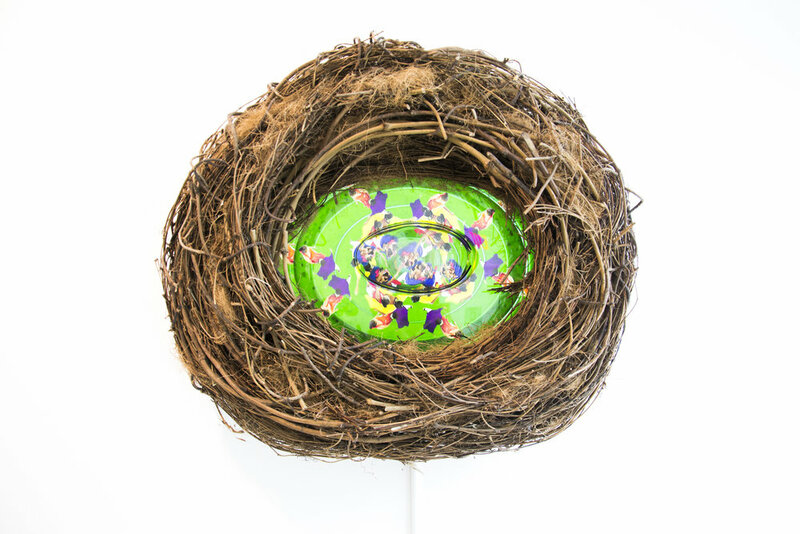 The creatures of her videos act in harmony to evoke awareness of nature’s beauty and fragility, and reveal the secret lives of flora and fauna. The dancers assemble into provocative questions on screen, engaging the viewer in a rhetorical conversation that urges them to explore the complex balance between humans, nature and the consequences of contemporary environmental issues. The visual collages are generated using a combination of elaborate, choreographed dance pieces overlaid with footage taken from the artist’s international travels to the Peruvian Amazon and India. Inspired by cultural traditions, each element represents a mandala, and forms a blueprint of the exhibition. Unique scent combinations accompany each element, engendering a subtle yet powerful scentscape that complement Loner’s fully immersive, sensorial experience. At the apex of the exhibition, all five elements and Mandalas come together to form a miniature universe consisting of Videoplanets of various sizes floating in the two-story atrium of the gallery. Videos representing the five Mandalas form a spiritual representation of the universe and are projected onto the Videoplanets, animating the perfectly round spheres and unifying the elemental themes of the exhibition. 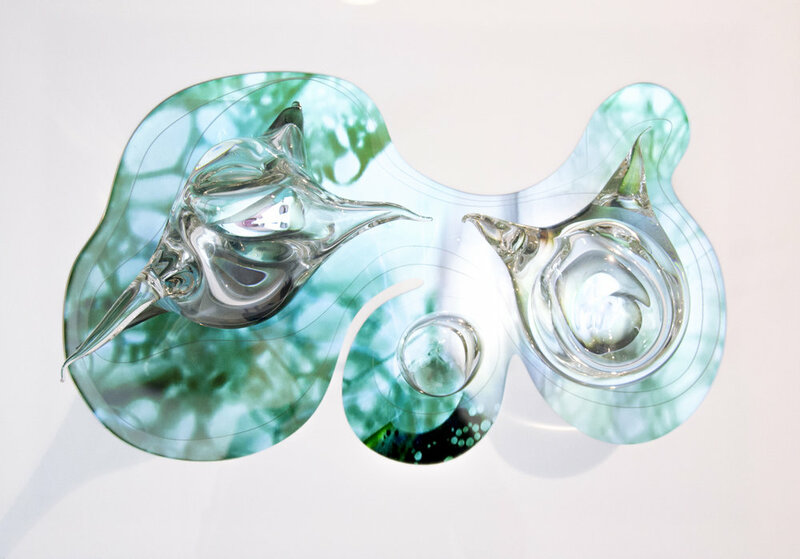 Loher’s work is conceived in a collaborative process with her team. For the present exhibition, artist Tansy Kaschak creates unique aroma combinations to accompany each element, engendering a subtle ‘scentscape’ that complements Loher’s fully immersive sensorial experience. Born in Zürich, Switzerland, Loher studied art in Geneva and Basel. Since 2004, she has lived in New York City. Her unique video objects have won her numerous awards, and now form part of several significant collections. Loher’s work has appeared internationally in many solo and group exhibitions including: Core Club, New York, USA (2017); Bruce Museum, Greenwich, CT, USA (2016); C24 Gallery, New York, NY, USA (since 2013), Anya Tish Gallery, Houston, TX (since 2009); Gallery Andres Thalmann, Zurich, Switzerland (since 2010); NBMAA, New Britain, CT, USA (2015); TelFair Museum, Savannah, Georgia, USA (2015); World Expo Museum, Shanghai, China (2014); Figge Art Museum, Davenport, Iowa (2014); MuBE, Museu Brasileiro da Escultura, São Paulo, Brazil (2012); Venice Architecture Biennale, Venice, Italy (2010); MAXXI Museum, Rome, Italy (2010); United Nations Pavilion, Shanghai Expo, China (2010); (Biennale Chongqing, China (2009); Siggraph Asia, Yokohama, Japan (2009); Art Digital, Moscow, Russia (2005) and the State Hermitage Museum, St. Petersburg, Russia (2005). 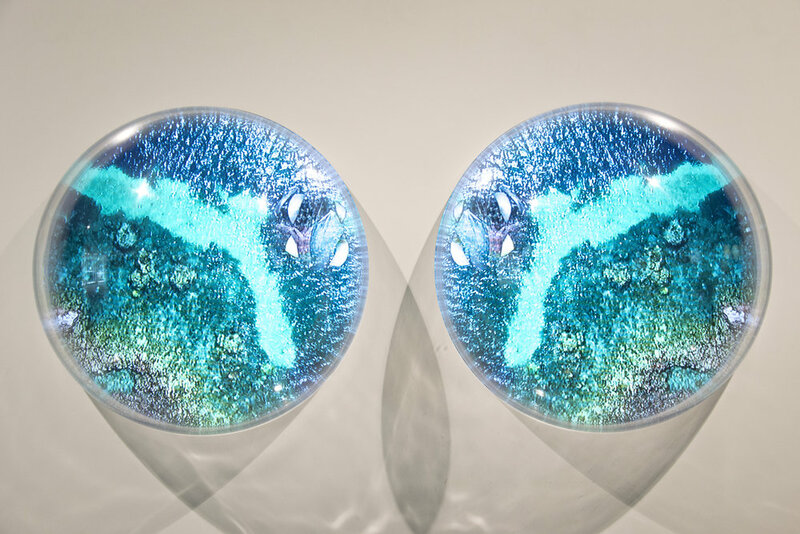 Katja Loher’s work is featured in numerous notable private and public collections including Credit Suisse Collection, Zurich, Switzerland; The Telfair Museum, Georgia, USA; Jorge Perez Collection, Miami, USA; 21C Museum, Kentucky, USA; Anthem of the Seas Art Collection, Miami, USA; Arte Al Limite, Santiago de Chile, Chile; eN Arts Collection, Tokyo, Japan and Horsecross Collection, Perth, UK. In the last years the artist has received several awards including TPC CreaTVty Award from the Swiss TV Production Center, as well as a number of distinguished artist residencies in New York, Berlin, Beijing, Brazil and India. Loher’s work has been commissioned for large-scale Art & Architecture projects at the new headquarters of SwissGrid, Switzerland (2018), Related Group/Jorge Perez, at SLS Hotel, Miami, USA (2016), and Oasis VIP Lounge, at Bogota Airport, Colombia (2015).